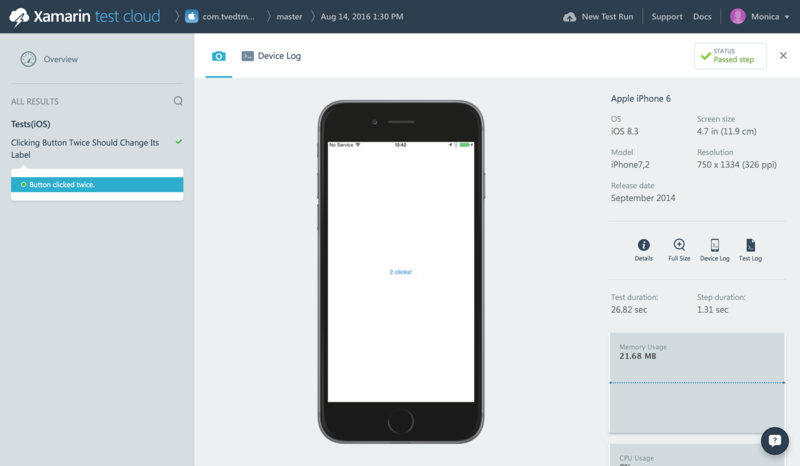 This summer, starting our HeartStarter v.2.0 project, a Xamarin.Forms mobile app for both iOS and Android, we knew we wanted to improve our workflow and have better quality assurance. Thus we decided to start writing and submitting our UI tests to Xamarin Test Cloud, and setting up continuous integration for all our apps. 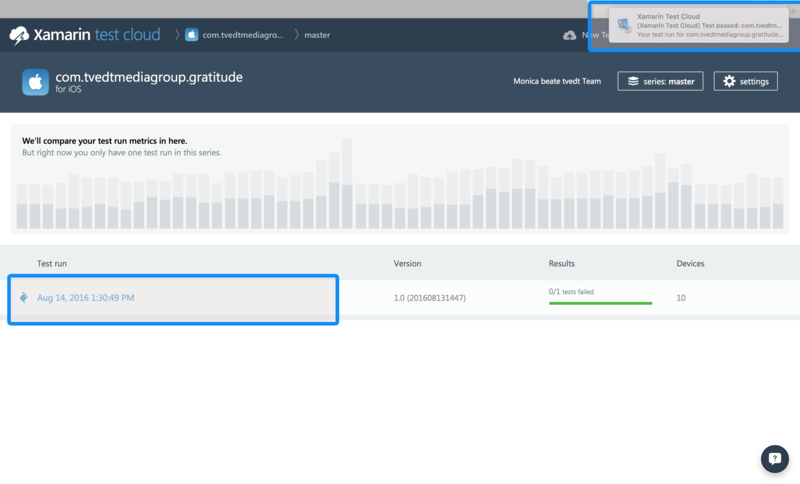 These topics will be covered in two blog posts: Part 1 - How writing, running and submitting UI tests to Tamarin Test Cloud, and a Part 2 - Setting up Continuous Integration for your Apps. 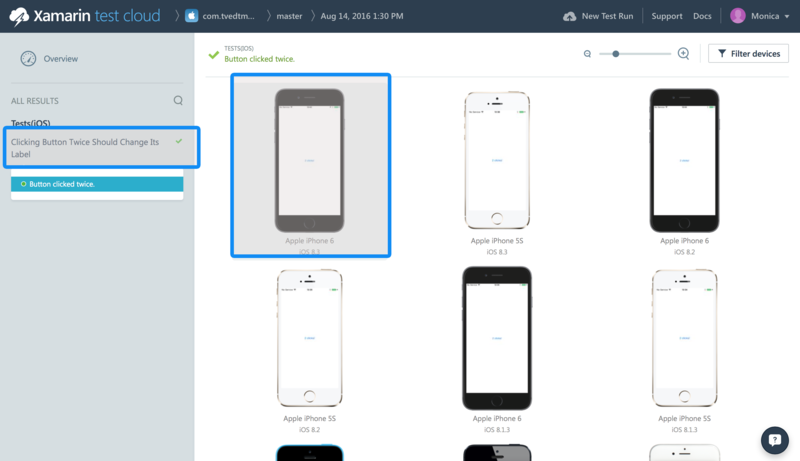 After reading Part 1, you will be able to write and execute your first tests and validate the functionality of your iOS and Android Apps by running it on hundreds of devices in Test Cloud. As described by Xamarin in their "Introduction to Xamarin.UITest" guide, Xamarin.UITest is a testing framework that enables Automated UI Acceptance Tests written in NUnit to be run against iOS and Android applications. It integrates tightly with Xamarin.iOS and Xamarin.Android projects but it can also be used with iOS and Android projects written natively in Objective-C and Java. 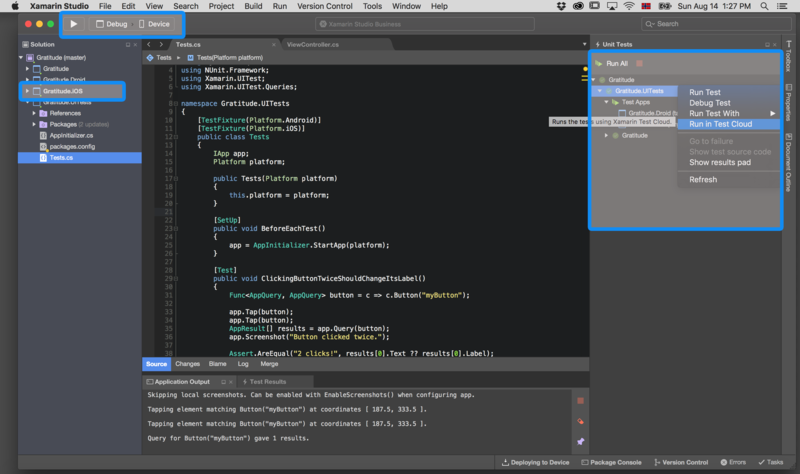 Xamarin.UITest is the Automation Library that allows the NUnit tests to execute on Android and iOS devices. The tests interact with the user interface just as a user would, enter text, tapping buttons, and performing gestures – such as swipes. Arrange – The test will setup conditions and initialize things so that the test can be actioned. Act – The test will interact with the application, enter text, pushing buttons, and so on. Assert – The test examines the results of the actions performed in the Act step to determine correctness. For example, the application may verify that a particular error message is displayed. For this demo, we have a small app that presents the user with a button that says "Click me!". When clicking the button, it changes the text to "x clicks! ", where x represents the number of clicks. Lets take a look at the actual code for achieving this. 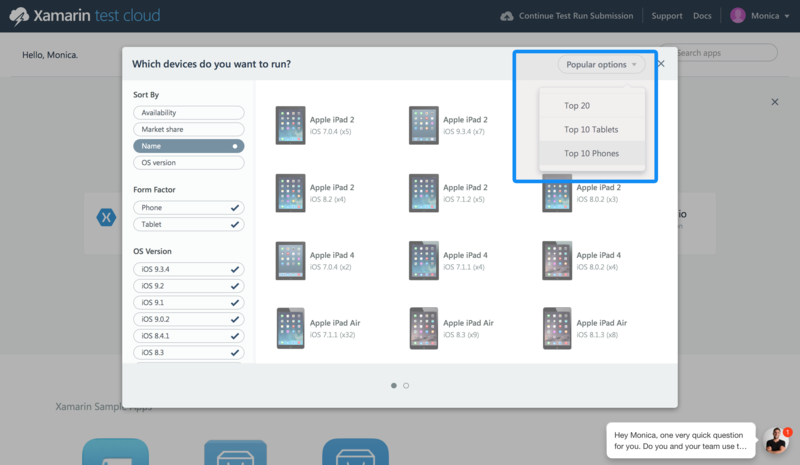 Click "Run all" in the test-panel, this will automatically launch your app and run the given test. 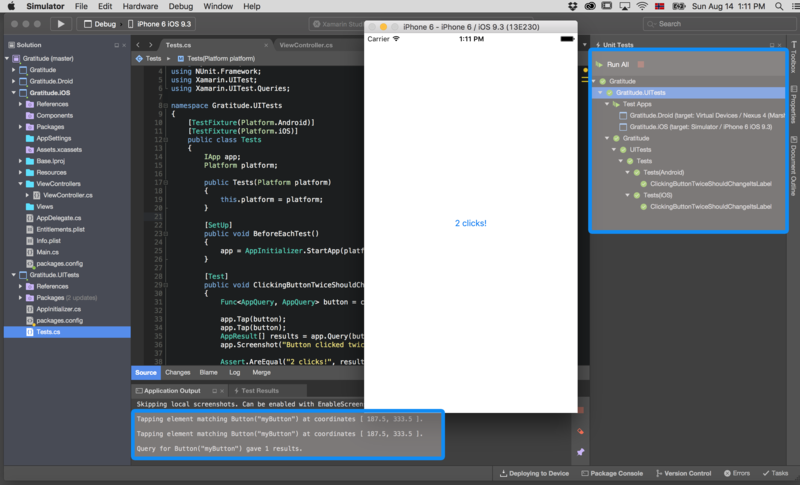 The screenshot below shows the test being run through the iOS simulator. But we want to make sure this works not only in our simulator, but on an actual device, on the most commonly used devices, so we can assure our users are having the same experience using our app as we have. 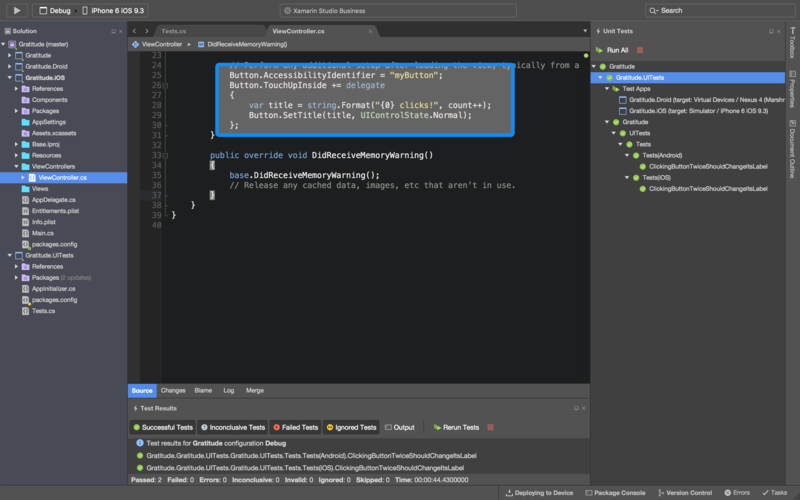 Both Visual Studio and Xamarin Studio can submit UITests to Xamarin Test Cloud when the solution contains both a mobile Xamarin project and a UITest project. 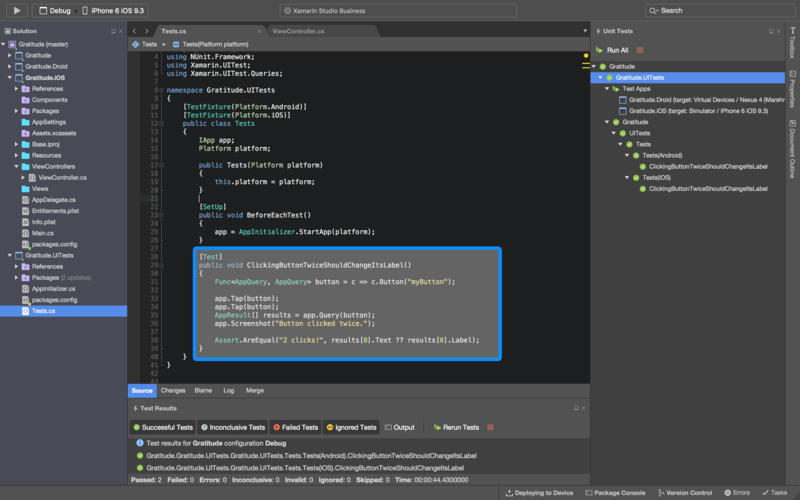 When UITests are submitted to Xamarin Test Cloud, the IDE will rebuild the application and the tests and upload the binaries, placing them in a queue for execution. Before submitting an iOS project, you must ensure that your build configuration is set to Debug > iPhone and that the iOS project is set as the startup project. 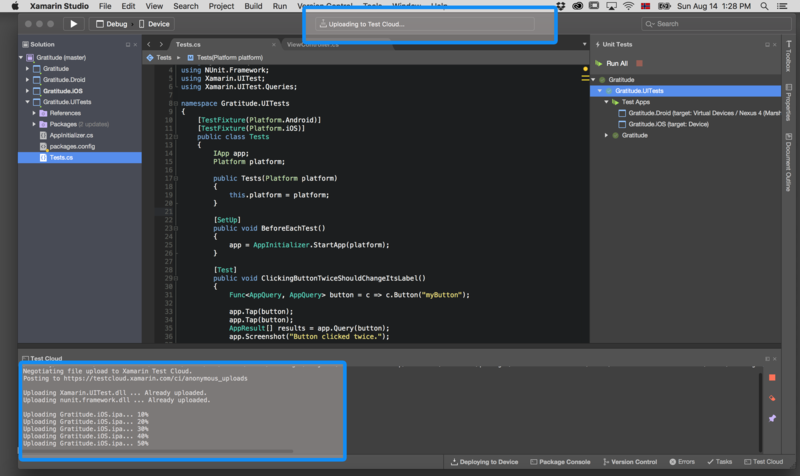 Next, right click on the project in the Test Panel, and select Run in Test Cloud. 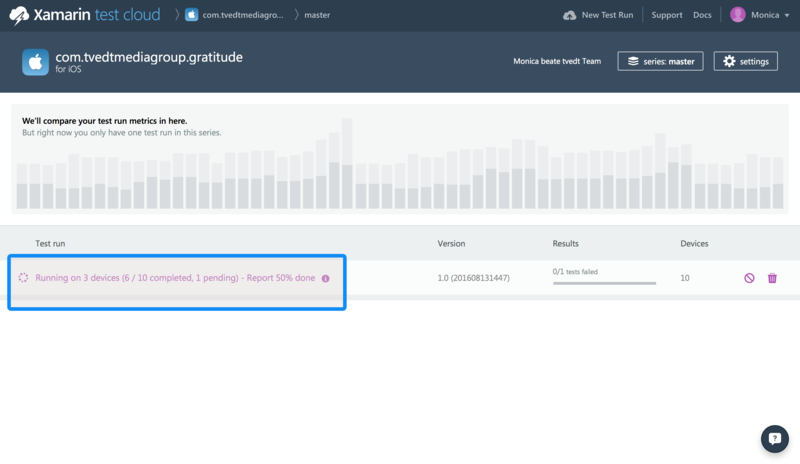 Happy testing and remember to read my next blog post where I will teach you how to set up continuous integration for your app using Team City!